I feel like doing this. These boys played hard and then passed out even in the midst of getting a bite of popcorn. Instead I am finishing up a batch of black bean burgers. They are labor intensive but totally worth it and will be easy and fast to reheat. Since I can't do bread or at least have not found one that tastes good and does not infract me, I use tasty leaf lettuce as a wrap. Pickles, mustard and ketchup make the burger for sure!! 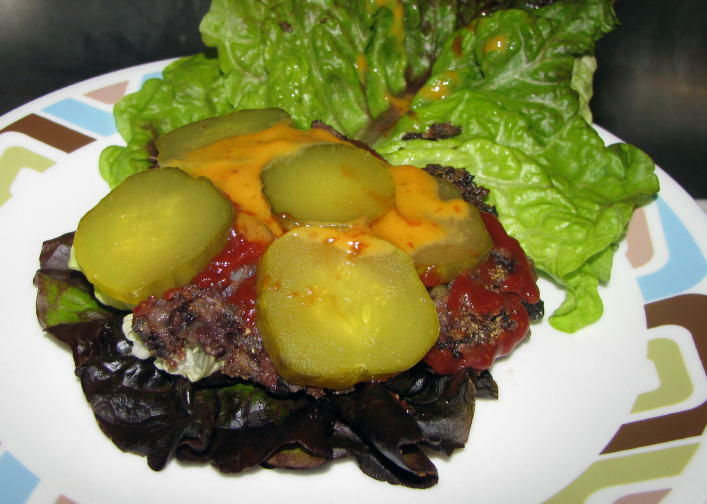 Its very colorful lettuce so hard to see the burger in there! You want to know the secret ingredient??? Nutritional yeast! It adds a cheesy and rich flavor to a potentially bland food. These are by far the best batch yet! I am cutting out dairy for a while to see if it is an issue. Something other than gluten is causing a problem. I am also cutting out eggs and will try them again methodically in a couple of weeks. I ran 6 miles this morning and I don't want to have a bad attitude but it was hard and frankly sucked! I just couldn't find my groove. I am tired and taking tomorrow completely off. I am thinking of running an Earth Day 5k on Sunday so want to make sure I am rested tomorrow. I watched the last episode of Ugly Betty and just couldn't get into Lost so that probably had an effect on my mojo. I was sad to see Betty go even though even I can admit it was time. So some things I am thankful for that I didn't get added to the list from Thursday. liking my hair. They seem like silly things but they made me appreciate the luxury that I have and I smiled. I am thankful that Jupiter my non verbal 8 year old son who has autism is not depressed or having behavior issues due to his communication device being repaired like he had last time. He is not happy about it but he is still doing well. I am going to do a review of these books. They each offer a unique and inspiring perspective of running. I wish there were more hours in the day. I would skip sleep if I could! What I am listening to- I am really liking Mumford and Sons these days. 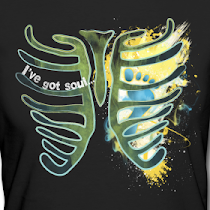 There is a line in the song Awake My Soul that is truly beautiful and fun to sing along with. I am also loving Regina Spektor. On the Radio is such a great tune and she is so easy to look at! 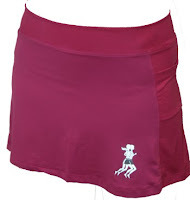 Gear I am diggin on- If I run the Earthday 5k then I am going to wear my Whooha Gear "Gotta Run" t-shirt and my Fuschia RunningSkirts Skirt. The little flowers are a reddish pink although its hard to see in this picture. I wish I would have gotten a smaller size but it is still a great T.
The twins sent me a care package that included a strappy bra, a pink skirt and some white compression socks. I have been loving the bra and skirt. Its very light and comfy. I have not tried to carry anything in the pockets yet and am worried it will pull the skirt down! One of the cool things about the Earthday 5k is that in the spirit of earthday all participants will receive an organic cotton t-shirt, a reusable water bottle and an heirloom tomato plant! How cool is that for swag! I think I am still in the lead for the photo contest over at Shut Up and Run but want to keep a nice lead for the next couple of days until the end! If you have voted already, thank you so much! If you have yet to vote, go here and vote for Barefoot Angie Bee!! 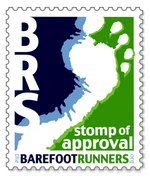 I am enjoying thinking about the inaugural Barefoot Angie Bee 50k I want to run this year and I could so use the hydration pack that is the prize for this giveaway. There will be no support for the race so I am planning on carrying and stashing my supplies. The hydration pack would be perfect and of course I don't have the money to spend on running gear right now....story of my life with 4 boys!! Thinking of a t-shirt design even! That was more like 3 and 3/4 for friday but I am about to pass out sitting here just like the photo of Milo and Archimedes! Good luck to those racing this weekend and safe travels to those going to Boston! Yay Boston! That burger looks yummy! I love nutritional yeast :) I'll have to try the lettuce idea too cause you're right pickles and ketchup DO make the burger ! yum! That burger dish looks yummy. I have to try nutritional yeast. Can you get it at a regular grocery store? I often use romaine lettuce leaves as wraps for my bread-less sandwiches. Funny, I can't wait for my coffee to brew either. Speaking of which, I could use another cup. By the way, did you beat your kids with a bat to knock them out or what (looking at his forehead)? I love the pause thingy for my coffee too! can't wait either. oh, and I am still really diggin' my chia seeds. researching them and def doing an article both for the examiner and for my blog next week!thx so much again! 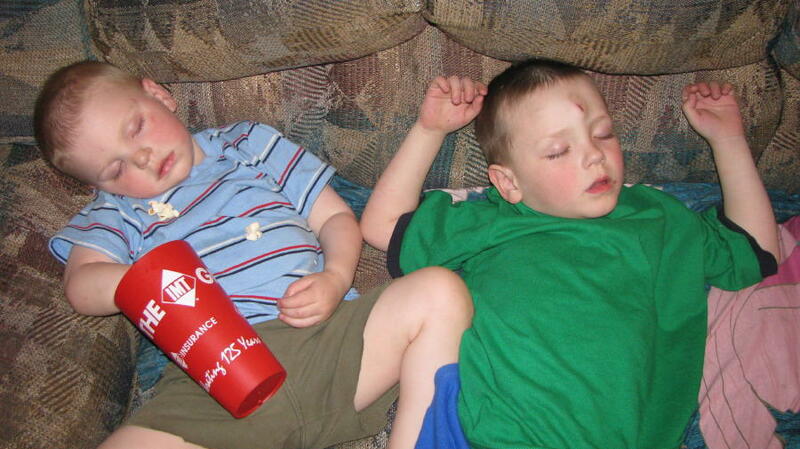 What a sweet pic of your little guys! You are smart to tune into your tired body and rest up. If you do the 5k, have a great race--love the swag you get! Reminds me of a local foods restaurant where I went last mother's day. All the moms got nice organic basil plants. Pretty cool. oh man that's exactly how I feel after a long run! I've made black bean burgers and haven't had much success. I'll have to give that a try too - looks delicious! Cute shirt & skirt too! You're going to be one foxy mama! I often use lettuce instead of rolls or bread. I like it better! Yummy! I love the skirt. What a great color! I am running an Earth Day 5k too. It benefits Relay for Life. REI is also collecting shoes for Soles for Soles. Triple score! I will be on a high from all the good deeds no matter how I run in the race! that pic of you is classically awesome!!!!!!! Awww man...It woulld be nice to pass out like that. I'm tired! That picture IS the best!! Loving the skirt. Think u NEED one of those! !